Aerocare has now completed installation of our first Boeing 757-200 Lavatory modification kits for Air Astana! Why aren’t more Airlines phasing out the 757? Whilst many Airlines have opted to phase out the 757 in favour of the more fuel efficient 737NG, some have failed to achieve the payload range needed for some of their medium to long haul routes. Quite simply, Airlines are complaining that there is no suitable replacement for the 757 and are extending their leases until they can find solutions to reduce weight in the smaller less powerful jets. The problem with extending the 757 lease period is that the aircraft interior is becoming very tired and out-dated, with many of the interior components not having been refurbished for over 20 years. Without the necessary updates and modifications to the cabin interior, airlines are at risk of losing market share to rival airlines. 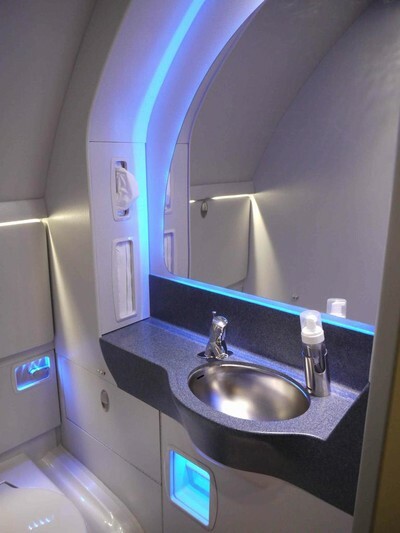 Whilst it is relatively easy to upgrade the seating and IFE equipment and re-trim / paint the general cabin, more specialist areas such as aircraft lavatory modules require more complex modifications, with very few organisations offering a quality, cost effective solution. Over the past few years Aerocare has worked on developing a modification kit to upgrade the Yokohama Lavatory module, right through from concept design to manufacture and installation. The first delivery of 4 Aircraft sets for Air Astana was completed quarter 4 of 2010, with 16 modules now flying.